Our Quality control department is manned by specially trained expert staff and each product is subjected to comprehensive inspection and functional checks. Continuous testing of standard models in line with most important Indian and Overseas standards provides the assurance of absolute safety and liability. The quality control checks are carried out for all the batches of raw materials including packing material and the finished product. 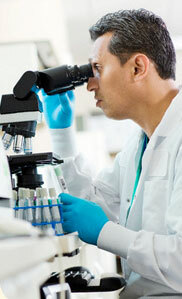 Every step in the production process is subjected to our rigorous quality assurance system. Our R & D facility is ISO 9001:2008 certified and all production and test records along with samples are preserved for minimum of 3 years. 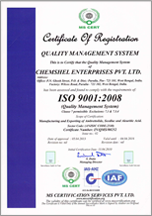 With such a track record and quality culture, Chemshel ’s R & D facility has earned the coveted ISO 9001:2008 certificatation. 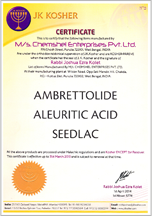 All Chemshel Products are Kosher Certified and are with Utmost Guaranteed Purity.